ADDIS ABABA, ETHIOPIA —Are you a journalist?” the young man asks me as we board the elevator. In Ethiopia, this is a loaded question. It earned me an extra 45-minute wait at airport immigration as officials thumbed through my passport, pawed through my luggage and asked me what my intentions were. Several international human rights groups have documented the systematic repression of Ethiopian journalists who were openly critical of the ruling party. About a dozen journalists and bloggers are in Ethiopian prison, accused of terrorism. Many more have fled into exile and are covering this year’s election from afar. Bold, I think admiringly. This is new – when I was assigned to Ethiopia eight years ago, in the aftermath of the government’s violent reaction to an opposition gains in the 2005 election, those sentiments were rarely spoken aloud – and certainly not to random journalists. Is he trying to bait me? I wonder. I get off at my floor, rattled. People take part in a Blue Party election rally in Ethiopia’s capital Addis Ababa, May 21, 2015. 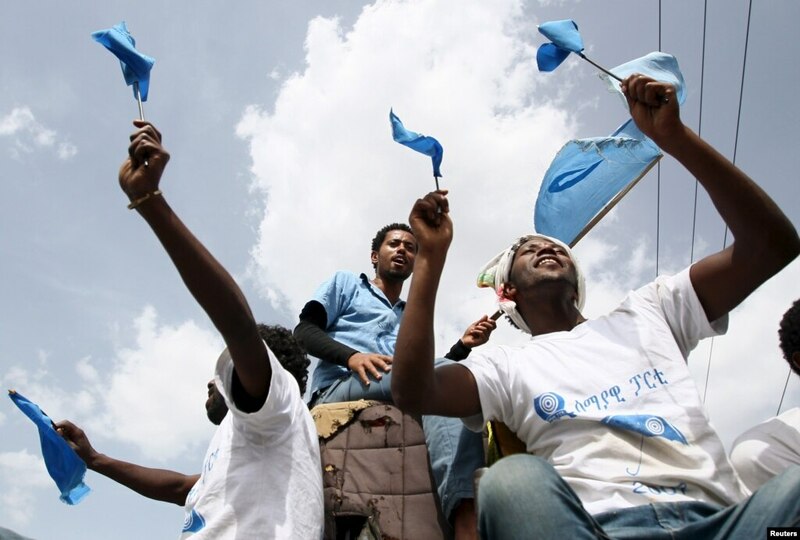 On the campaign trail, the nation’s newest opposition party winds its way through Addis Ababa. Crowds emerge to watch the procession. No one volunteers. One man covers his face when he sees me filming the street. The guy next to him takes his phone out and points it in my direction. I remove my sunglasses and stare at him. Opposition members say they’re confident of getting support at the polling booth. Blue Party spokesman Yonatan Tesfaye even predicts the various opposition parties will grab as many as 100 parliamentary seats, out of more than 500. This would indeed be a triumph: in 2010, the opposition won just a single seat. One opposition candidate, Yidinakachaw Addis, tells me he was arrested while trying to take food to his imprisoned friends, also opposition supporters. Later, the internet has failed in my hotel room, sending me frantically down to the lobby to try to transmit a TV story on the opposition campaign. “That is my feeling too,” he says grimly. 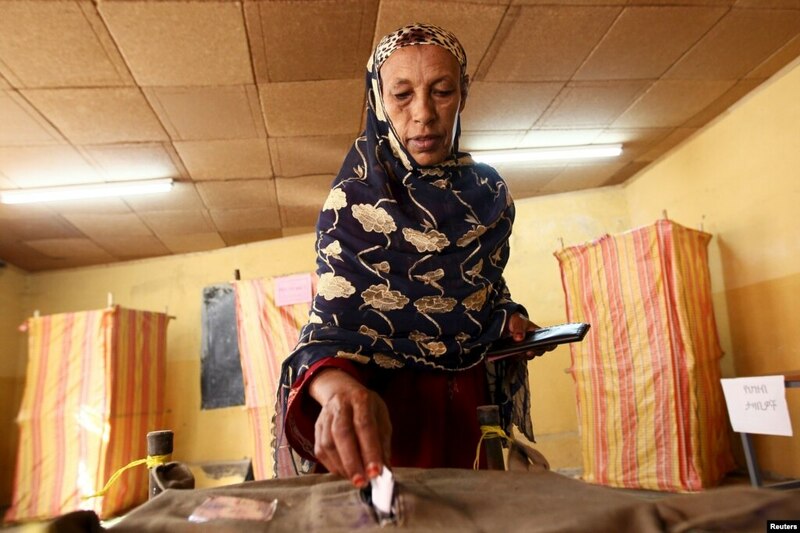 A woman casts her vote at a polling station, as Ethiopia’s national election kicks off in capital Addis Ababa, May 24, 2015. Election day starts before dawn. People line up at a typical Addis Ababa polling station. It is calm, orderly, polite. I go from station to station, and at all but one of them my election badge allows me easy access. “What are you doing here?” asks a burly dude in a leather jacket at that one station. I’m tempted to tell him I’m on vacation, and just thought it might be fun to, you know, drop by a polling station at 6 a.m. with a video camera. But more burly dudes come over. They tell me to wait, order me to point my camera at the ground. Finally an election official comes out and scrutinizes my badge. “I know,” I say tartly. I have little trouble finding ruling party voters. They are, after all, the majority. But I approach voter after voter in an attempt to get a variety of views. Several actually run away from me. The next day, I meet someone who knows one of the nine jailed bloggers and journalists. He asks not to be identified for fear of reprisal. He says he fears that talking to me so soon after the election could make things worse for the group. I grill the poor man. “Is it possible,” I ask, “that any one of the nine could have links to actual groups trying to overthrow the Ethiopian government?” That’s the ostensible reason for their imprisonment. Could his friend, who he swears is innocent, have been accidentally pulled in over her head? He shakes his head and notes that the prosecution hasn’t presented any evidence of terrorism. “I think it’s a fear of the future rather than a crime of their past that they were arrested for,” he says, explaining that the longtime ruling EPRDF party fears reprisals if they ever lose power. There’s no obvious sign of this repression he’s talking about. As we sit and talk in a cafe, we both look nervously at a succession of lone men who fill up the tables near us, studying their phones. I later drop in to see a local business owner, who tells me that three of his workers called in to say they were too afraid to come to work. They refused, he says, to say more. We talk about rampant rumors that the ruling party has won 100 percent of the vote this time, and I stress that only official results count. 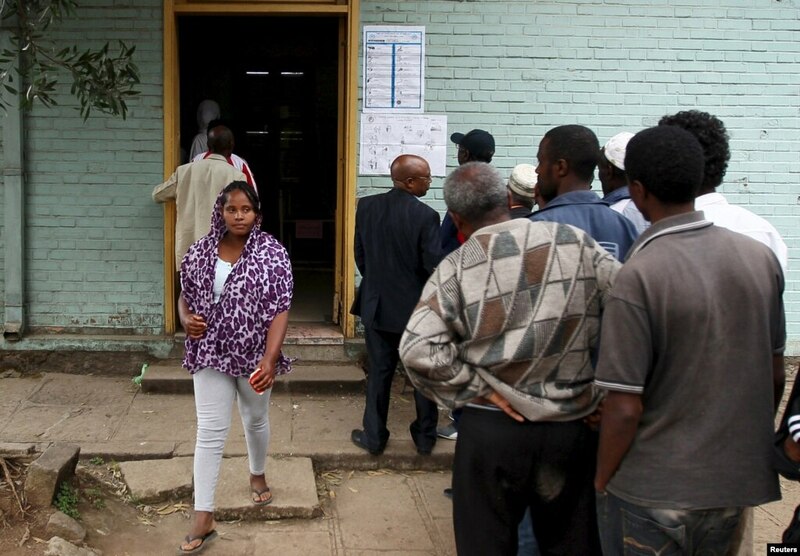 A woman leaves after casting her vote at a polling station, as Ethiopia’s national election kicks off in capital Addis Ababa, May 24, 2015. As journalists, we are limited to the attributed, the concrete, the verifiable, and the achievable. And so, my stories from this election show orderly polling stations, happy voters, and government supporters. But my stories on this election are largely missing a silent, and silenced, group. I have no idea how big this group really is, as many won’t speak to me once the video camera or voice recorder come out. Those who told me they didn’t bother to vote insisted that information was off the record. The blogger-journalist group tried to vote, the friend says, as they have not been convicted of anything and therefore are still eligible. But prison authorities told them there was no nearby polling station. Opposition campaigner Ephraim Sahle Selassie says he believes that free expression is unstoppable, with the growth of technology and social media. But for now, in Ethiopia, free expression is just a dream for the future.